There's a neat new documentary playing at the Bloor Cinema right now. It's all about urban waterways that have been buried underground. Toronto — and the Garrison Creek — play a big role. And there are also fascinating examples from London to Yonkers to Seoul to Brescia. 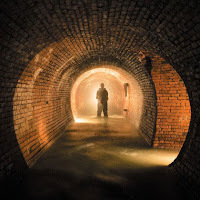 The filmmakers venture down into the sewers with illicit underground explorers known as "drainers" (the group in Brescia have even been officially supported by the municipal government, giving tours beneath subterranean Roman arches or searching for long-lost medieval ponds). And the documentary raises all sorts of interesting questions about the strains placed on Toronto's sewer system — which was originally built back in the days when Queen Victoria was still on the throne, and hasn't been updated much since. (It's an especially pressing question as our population booms and as climate change threatens to bring us ever-more frequent bursts of intensive precipitation. We already dump raw sewage into the lake every time Toronto gets a particularly heavy rain.) There's also some very interesting discussion about daylighting buried streams — which is what you call it when you uncover a buried waterway and bring it back to the surface. They've done it in Yonkers and in Soeul and Lost Rivers takes an honest look at both the positive and negative effects those projects have had on their communities. The film is playing at the Bloor until Thursday, March 7, and there's a Q&A session after some of them. You can find all the rest of the deets here.